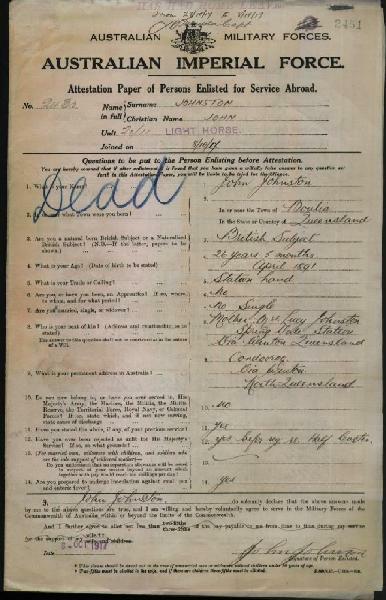 2430 Pte John Johnston, Attestation Paper, p. 1. 2430 Pte John Johnston, B103, p. 1. 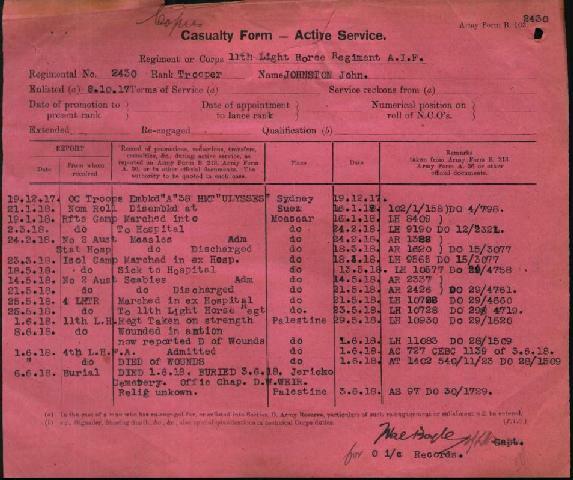 The B103, the Casualty Form - Active Service indicates that 2430 Pte John Johnston was killed in action on 1 June 1918. To find the details of the incident which resulted in his death, the unit War Diary is necessary. 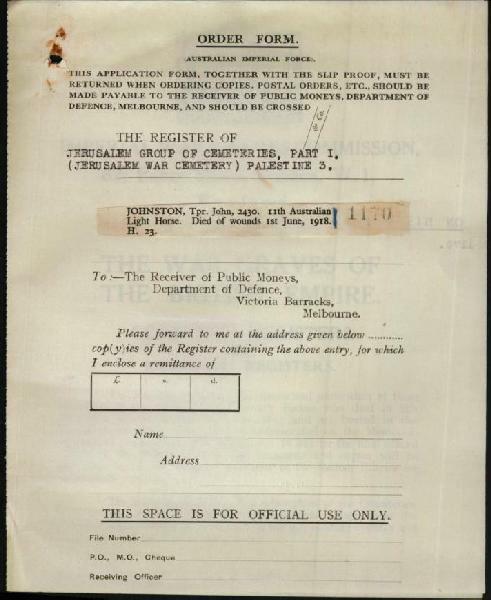 Below is the specific entry for that particular day from the War Diary of the 11th Light Horse Regiment, 1 June 1918. 2430 Pte John Johnston, 11th LHR War Diary, 1 June 1918. At 4pm, 1 June 1918, the Turkish artillery sent two shells amongst a group of horse being led by the horseholders, possibly for the purposes of watering them. 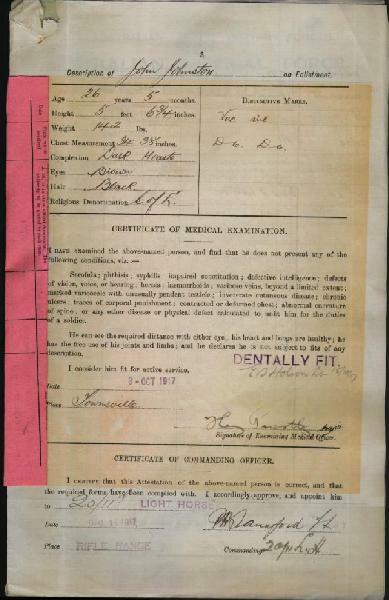 2430 Pte John Johnston was badly wounded by the shelling and removed to the 4th Light Horse Field Ambulance for care. It was here that he died. 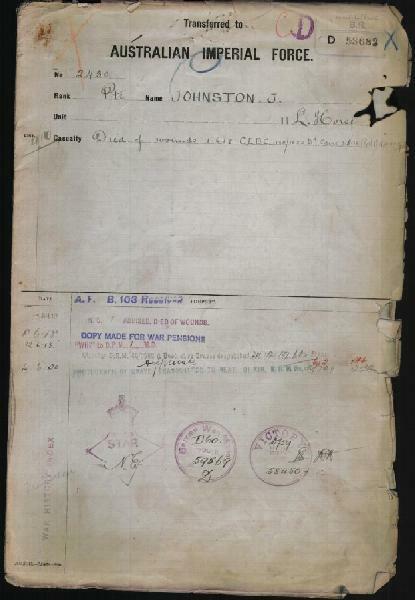 2430 Pte John Johnston, AIF D, p. 1. One contact with the relatives of a deceased soldier was the words to be placed upon the tombstone. 2430 Pte John Johnston, Tombstone Inscription. 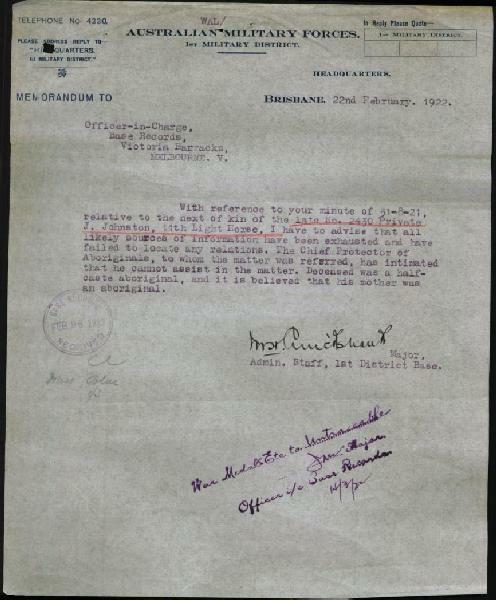 When the Australian Military Forces, 1st Military District, the medals belonging to 2430 Pte John Johnston were sent to his next of kin who was his mother. 2430 Pte John Johnston, Medal delivery problems. The medals could not be delivered and after exhausting all efforts to find the mother, the medals were returned unclaimed. This was by no means unusual. Over 30% of medals earned during the Great War in Australia were never claimed.